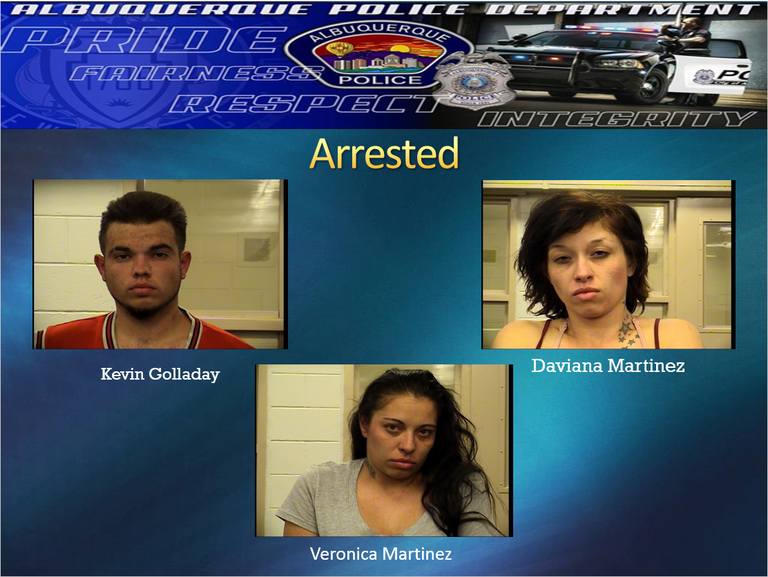 Veronica Martinez, 30, Daviana Martinez, 23, and Kevin Golladay, 21, were all arrested and charged with Residential Burglary and Conspiracy. Golladay had an outstanding warrant on other felony charges. 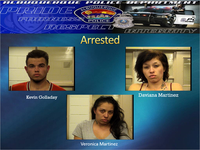 On 04/10/2017 at about 3:30 p.m., the Albuquerque Police Department Southeast Area Command officers were dispatched to an in-progress residential burglary in the 300 block of Carlisle Blvd. Officers arrived and located a black Ford Explorer parked in the driveway that neighbors said did not belong to the resident who lived there. Upon officers arrival, officers located Veronica Martinez outside in the driveway of the residence and she was taken into custody. Daviana and Kevin were still inside the residence and when they learned police were outside they fled out the back door. The quick response of additional units made it possible to quickly locate Daviana and Kevin in the area of Solano Dr and Marqeutte Ave as they attempted to flee. Both were taken into custody without incident. No other suspects were located after police checked the 80 year old victims home. Kevin Golladay was recently identified by the Bernalillo County District Attorneys office as an offender responsible for a violent crime spree where neighborhoods were terrorized and who belonged to a group who encouraged minors to participate in their crimes. He was recently issued a warrant for charges to include racketeering, auto and residential burglary, gun thefts and extreme cruelty to animals. He failed to show up to his arraignment for these charges which warranted the arrest warrant. The Southeast Area Command field units did an outstanding job yet again getting these suspects into custody. They were booked into a familiar place, the Metropolitan Detention Center, for the charges of Residential Burglary and Conspiracy.